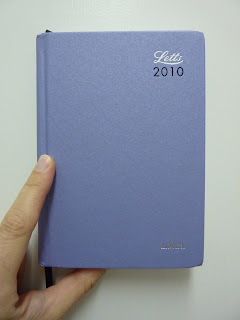 Here is my 2010 Letts A6 size Principal daily diary/ planner. 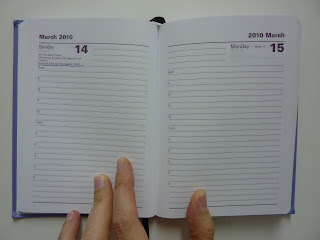 This is a very simple, basic day per page diary. Here is a rundown of the content: The first page is personal information, the next page is Notable Dates for 2010 and 2011, the next 2 page spread has calendars for 2010 and 2011 (with the days just as numbers, no writing space) and then starts the day per page section. At the back there are a few pages for addresses and notes. That's it. No maps, no international information, and most disappointingly, no monthly planning of any kind (whether months as columns or month per page). Despite the spartan content, this diary has some finishing touches that make it a really nice book. It has a hard cover which gives it an elegant book look and feel. The color choices are blue, gray, red and lilac, which of course was my choice (this photo looks more blue than the actual color). I chose to have my initials imprinted on the cover, which is a really nice touch. The cover also has Letts 2010 imprinted in the top corner, and on the spine. But unfortunately, the product code (P1W) is also imprinted on the spine and back cover, which is not attractive at all. The book has a ribbon page marker, which is infinitely preferable over tear-off corners for a day per page book. This (4 1/4 x6 inches) is an excellent size for a daily book. Small enough to carry around everywhere, but the pages are still large enough for plenty of writing. It's not large enough to use as a journal, for me at least, but as a basic planner or reminders book it's a good size. The paper is fine, nothing to write home about. There is a little bit of show-through to the other side but it's not terrible. The paper does not have the silky-smooth feel that you could expect from a Moleskine, Quo Vadis or Exacompta brand planner. 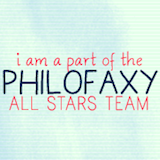 I can't quite figure out what color the text and lines are: brown? plum? Whatever it is, it's a good color because whether you use black or blue (or any other color) ink the writing stands out. One reason I bought this planner is because the daily pages have all of the holidays for the UK and US (and also Canada and Australia), which I really like having on my planner pages. In all it's a good little diary/ daily planner. For someone who lives in the UK, it's a good price at less than 7 pounds. But I got the personalization, and paid for international shipping, which together wound up to be about the same cost as the price of the book. To me it was worth it because I wanted to get this book last year but by the time I got around to ordering it, they were sold out. I like this size as a carry-everywhere book. And, I'll admit, I'm a sucker for personalization so that was a big selling point. And hey, it's purple! How could I resist? Daycraft Vogue diary review and giveaway! Daycraft Executive diary review and giveaway! Daycraft Sneak Peek: Reviews and Giveaways! When is a planner not a planner?